Students will be learning about Francis Scott Key, the Battle at Fort McHenry, and the story of the composition of The Star-Spangled Banner. Students will be learning to sing the song, The Star-Spangled Banner through several methods such as listening, repeating the words in rhythm, and reading the words and following along with the music while singing the song. They will learn about the Battle at Fort McHenry and Francis Scott Key through listening to several children’s books. 1. 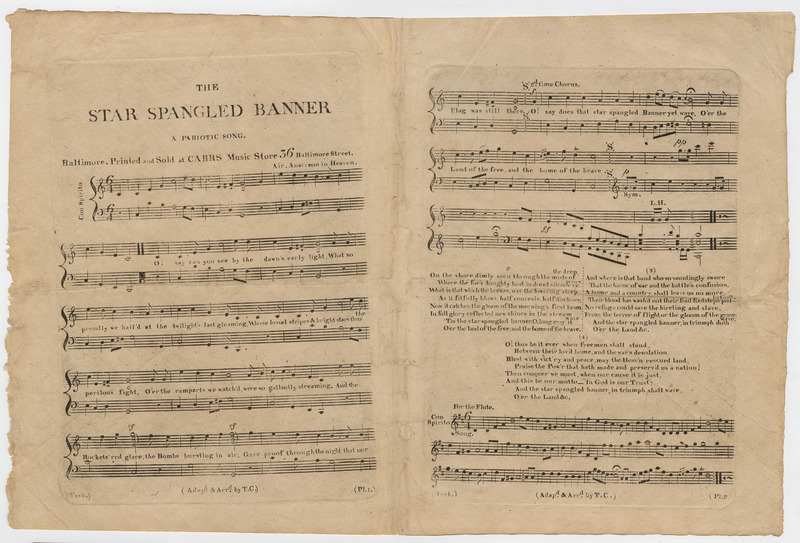 Play several different recordings of The Star-Spangled Banner, both instrumental and vocal to introduce the song, instructing students to listen carefully. Have a discussion about the music-what was the same/different, what instruments did you hear, what is the name of the song? 2. Read a story book to the students about Francis Scott Key, the Battle at Fort McHenry, and the writing of The Star-Spangled Banner such as By the Dawn’s Early Light-The Story of the Star Spangled Banner by Steven Kroll and Dan Andreasen. 3. Teach students the words to the song The Star-Spangled Banner using several different activities so that different learning styles will be used. Begin by having the students repeat the words in rhythm, repeating each line and then adding additional lines. Have the students follow along with the words while singing. Define any difficult words while teaching the students the song. Have students follow along with the sheet music while singing. 4. Show students the original manuscript in Keys handwriting, the first Broadside, and the first printed sheet music. 5. To further practice and reinforce the words, have students sing along with a story book that has the words to the song or with a you tube video that has the songs lyrics. 6. Students will also learn and sing several other Patriotic songs for the school assembly on 9/12/14 celebrating the 200th anniversary of The Star-Spangled Banner including Yankee Doodle, You’re a Grand Old Flag, and America-My Country ’tis of thee. Star Spangled Banner by Rachel E.
This entry was posted in Education, Elementary, F.S. Key, Fort McHenry, History, K-2, Music Choral, Star Spangled Music Day, Uncategorized, Voice. Bookmark the permalink.